2 Dwellings With A Total Of 3 Bdrms, 4 Bas, Game Room, 2 Living Areas, 2 Kit. Relax and watch the White River flow by from the deck of this A-frame home in Lakeview, Arkansas. Situated between Bull Shoals State Park and Gaston's restort, White Star offers upscale accommodations, plus the enjoyment of trout fishing in one of the most desired areas of the river. Perfect for family vacations, fishing trips, family reunions, corporate retreats, honeymoons or simply a quiet get-away. Relax and watch the White River flow by from the deck of this A-frame home in Lakeview, Arkansas. White Star offers excellent accommodations. Outside, Relax on the large deck or one of the patios facing the river. This amazing property offers spacious grounds ideal for activities, entertaining, or simply enjoying the peaceful surroundings. We have a charcoal and gas grill for your favorite cook-outs. Laundry facilities are in both dwellings. White Star is a smoke-free and pet free environment. The main house features 2 large bedrooms, one with 2 queen size beds and 2 baths, kitchen with dishwasher and a loverly great room furnished to make your stay a comfortable one, including a TV and DVD player. The bookshelves hold a library of movies and books for your evening's entertainment. A guest house next door has a large bedroom with 2 queen size beds, full bath, a living area with a sofa bed and small kitchen. Attached is a rec room complete with a large HD TV and round game table. The Stafford family has been in Arkansas for 40 years. They purchased the property in 2003 and have made improvements every year. Until recently the property was mainly used for relatives and friends. Now we want others to be able to enjoy this great property. The area is absolutely beautiful having several lakes and rivers. There are many recreational activities in the area. The whole environment is very relaxing. The property sits on Cane Island shoals, one of the best fishing spots on the white river. We have great local dining and are close to Bull Shoals lake and dam. Property sits on the White River. There are stairs leading to the water. Great Fishing area. Great place, everything you need to have a relaxing getaway!!! Had a wonderful time. Thankful for the game room and beautiful deck. I loved the easy access to the river. Perfect location for those who wish to fish. Plenty of beds for everyone and spotlessly clean. The back deck makes a perfect place to unwind after a day of fishing. The garage turned into a game room worked wonderfully as a place to meet each morning and gear up for the day. Beautiful property. Had everything we needed. Bill was quick to respond and very accommodating. Can’t wait to go back and bring more family with us. Beautiful setting, wonderful location. The house had everything you would want or need. We enjoyed everything about the house. The inviting outdoor space and river view was fantastic. very clean and well maintained. Felt as if we were visiting someones home. Could not have asked for anything more. We loved it. Relax and watch the White River flow by from the deck of this A-frame home in Lakeview, Arkansas. 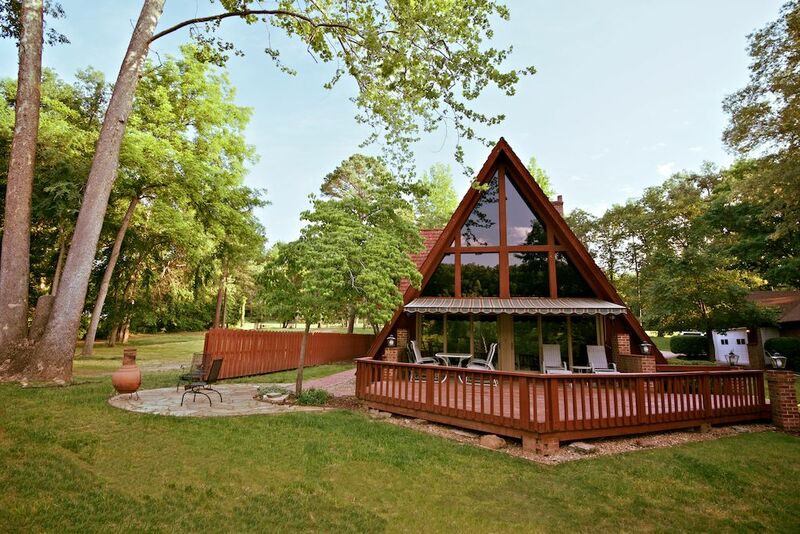 Situated between Gaston’s famous trout fishing resort and Bull Shoals State Park, White Star offers excellent accommodations, plus the enjoyment of trout fishing in one of the most desired areas of the river.